In this early photograph a gas lamp can be seen at the corner of Adelaide and York streets. Osgoode Hall is in the distance. The streets of Toronto were first lighted with gas lamps in December of 1841. 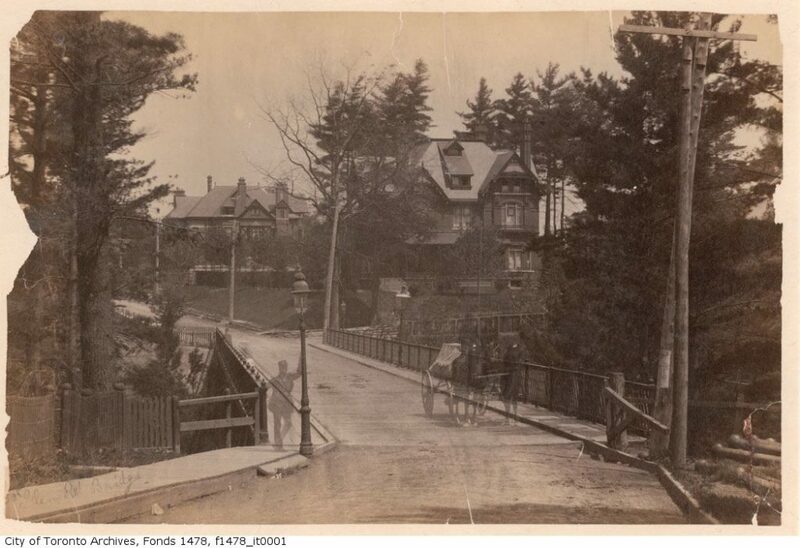 The gas was supplied by the City of Toronto Gas Light and Water Company, owned and operated by Albert Furniss. Night-time illumination was received enthusiastically by Torontonians, and even Charles Dickens commented on the novelty when he visited Toronto in 1842. However, as there were only about one hundred lamps confined to a few downtown streets, and since gas was expensive, most people continued to depend upon tallow candles to dispel the darkness. A ghostly figure of a man is shown leaning against a gas lamp used to illuminate the bridge. The Consumers’ Gas Company was formed in 1848, and by the 1870s it had the monopoly on supplying gas for the more than 2,000 street lamps that were lit each evening by lamp-lighters. In 1879, Consumers’ Gas also obtained authority to sell gas for heating and cooking. By the 1880s, more than 3,000 homes were lit by gas, but those who could not afford gas lighting were forced to rely on the cheaper light provided by coal oil or kerosene lamps. 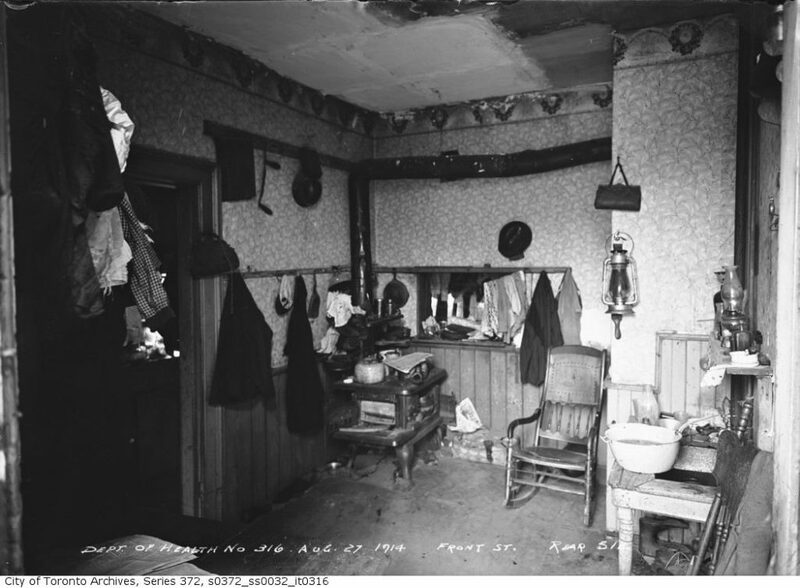 In humble rooms such as this, the lighting was provided by coal oil or kerosene lamps rather than gas or electricity. The introduction of electricity to the city initially was not for the purpose of street or home lighting, but rather for the operation of telegraph and telephone communication. The telegraph had been in use in Canada since 1846 and Toronto’s first telephone exchange opened in 1879. Both the telegraph and the telephone transmitted messages via an electric current along metallic conductor wires. They used energy that was produced chemically by batteries. The proliferation of poles overhead wires for telephone and streetcar service is obvious in this view. 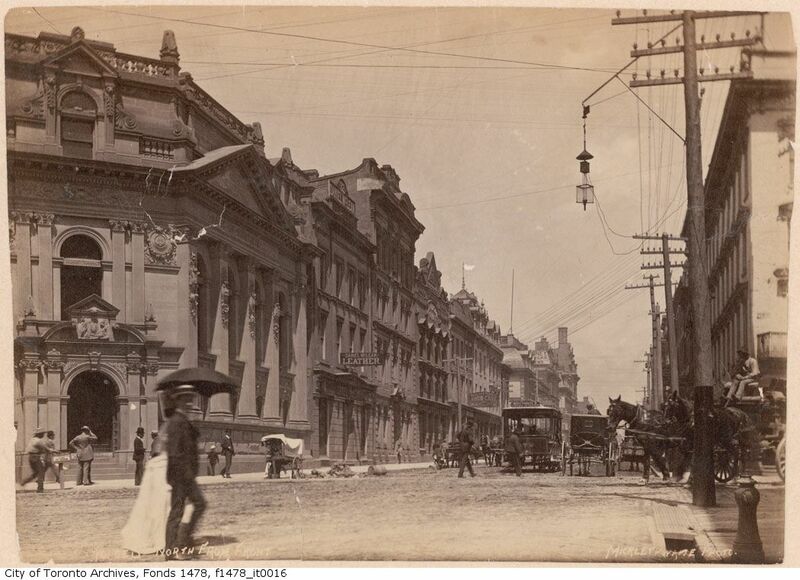 Electric lighting was first witnessed in Toronto in 1879 at McConkey’s Restaurant, located at 145 Yonge Street. To the delight of customers, the restaurant was lit up by two arc lamps powered by a small generator driven by a portable steam engine. The light produced in arc lamps was created by causing a spark to jump from one electrode to another inside a glass bulb. This was accompanied by a loud fizzing noise which must have been quite exciting. It was not long before the inventor-entrepreneur John Joseph Wright (1847-1922) expanded Toronto’s exposure to the harsh and brilliant light of arc lamps. 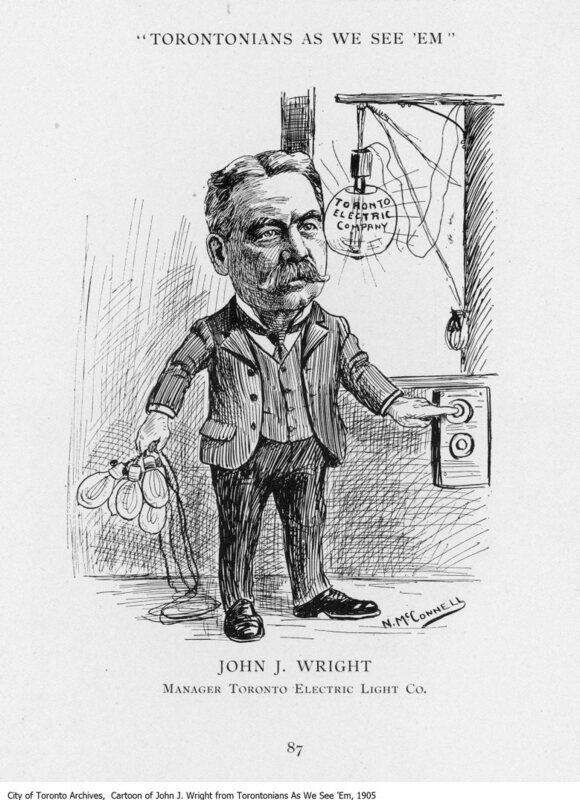 J.J. Wright built the first Canadian-made electric generator in 1881. 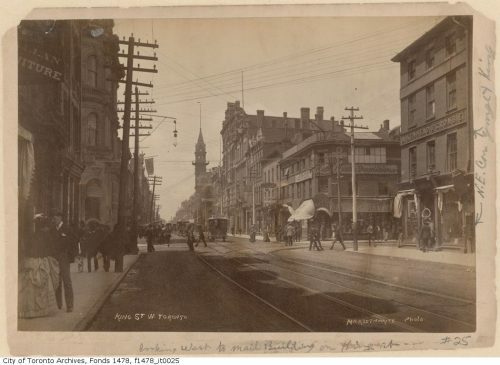 He installed his 25-horsepower generator near the north-east corner of Yonge and King streets and used it to power twenty arc lamps he installed in various downtown businesses. While he continued to supply his customers with electricity, he was formulating even bigger plans. 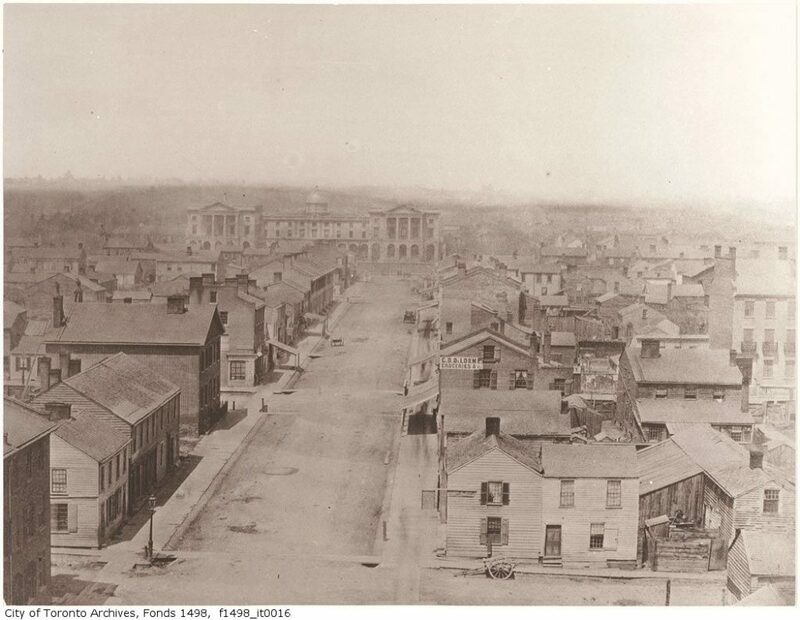 In 1882, Wright lit the buildings and grounds of the Toronto Industrial Exhibition (the precursor to the Canadian National Exhibition), allowing the fair to remain open long past sundown. 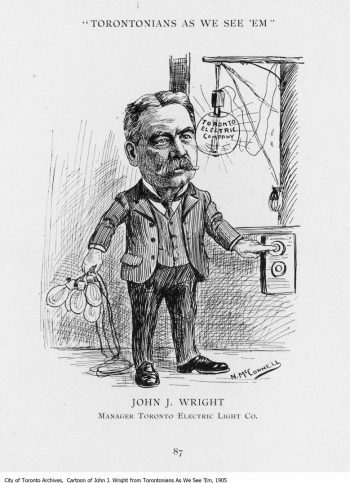 Wright’s first exposure to electricity was in Philadelphia in 1876. While there he attended lectures on electricity by Elihu Thomson and Edwin Houston, partners in electrical experimentation. They employed Wright, and in 1879 he helped install North America’s first electric arc street lamp. Afterwards, he returned to Toronto to represent the Thomson-Houston interests in Canada. An arc lamp hangs over the busy thoroughfare of King Street West. An arc lamp is shown opposite the Bank of Montreal building, which currently houses the Hockey Hall of Fame. 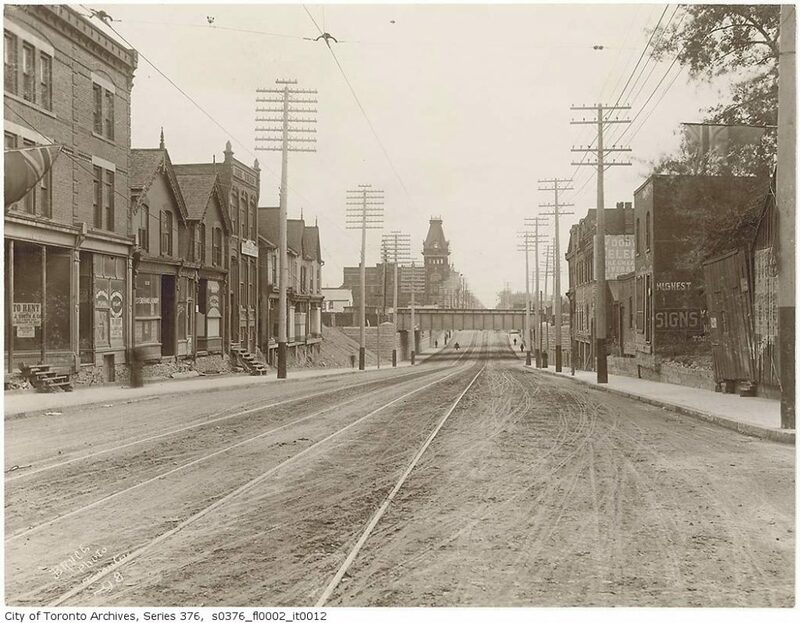 In 1883, Wright incorporated his business as the Toronto Electric Light Company (TELC). He decided to apply to City Council for the contract to light the city streets since the gas company’s contract was soon to expire. To raise the necessary capital for this venture, he convinced a group of Toronto businessmen, headed by stockbroker Henry Mill Pellatt (1860-1939), to invest in his company. Wright’s firm installed fifty 2,000-candlepower arc lamps along King, Queen and Yonge streets to illustrate the efficacy of electric lighting. However, council must have thought it prudent to hedge their bets, and in 1884 decided to divide the street lighting contract between gas and electricity. While the Consumers’ Gas Company would be around for many years to come, their comfortable monopoly over street lighting was ended. The last Consumers’ Gas lamp was removed in 1911.